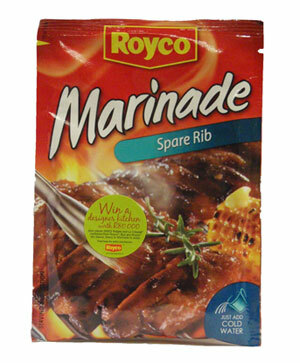 Royco Marinades are a quick and easy way to add delicious flavour to your meals. Simply add the contents of the packet to water and marinate the meat for 15 minutes. Sugar, Salt, Modified Starch, Flavourings (contains Wheat), Irradiated Vegetable Powders (Preservative, Sulphur Dioxide), Spices, Citric Acid, Monosdium Glutamate, Colour, Beef (contains Soy), Palm Oil, Wheat Flour, Tenderiser, Flavour Enhancer, Milk powder.